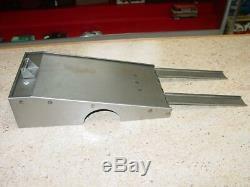 Very nice brand new custom made rear ramp bed race car hauler toy part. 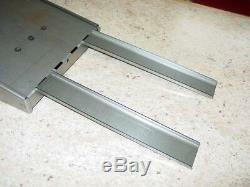 Made from pressed steel and comes with winch and ramps as pictured. Designed to fit directly on to the Tonka long frame chassis but can be modified to fit other brands. I've used these with the Nylint Ford cabover trucks, Smith Miller L Macks, Nylint Chevy trucks, Structo long frame trucks, etc. As I said, it may or may not require some modifications to use with anything other than the Tonka long frame but it CAN be done. Some modifications that may be required on other trucks are widening the front opening on the bed, adding spacers between bed and chassis, shortening or lengthening the chassis, etc. If you do not think those are things you can handle then I'd recommend sticking with the Tonka long frame. If you can handle some of those, your imagination is the only limit on it's uses. 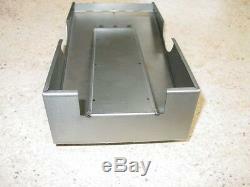 Overall length is 11.5" not including the ramps and width is 6.25". From the front of the bed to the center of the rear wheel opening it is 6.25 to help you calculate if your chassis will have the needed length. We are your one stop shop for all your toy restoration needs. Powered by SixBit's eCommerce Solution. 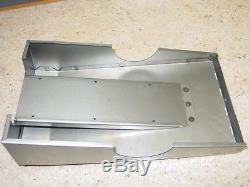 The item "Custom Race Car Hauler Rear Ramp Bed withWinch & Ramps For Tonka Etc. CUP-200" is in sale since Wednesday, December 26, 2018. 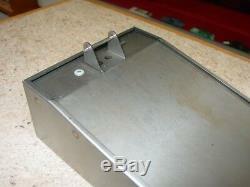 This item is in the category "Toys & Hobbies\Vintage & Antique Toys\Toy Parts". The seller is "toydecals" and is located in Onalaska, Wisconsin. This item can be shipped worldwide.